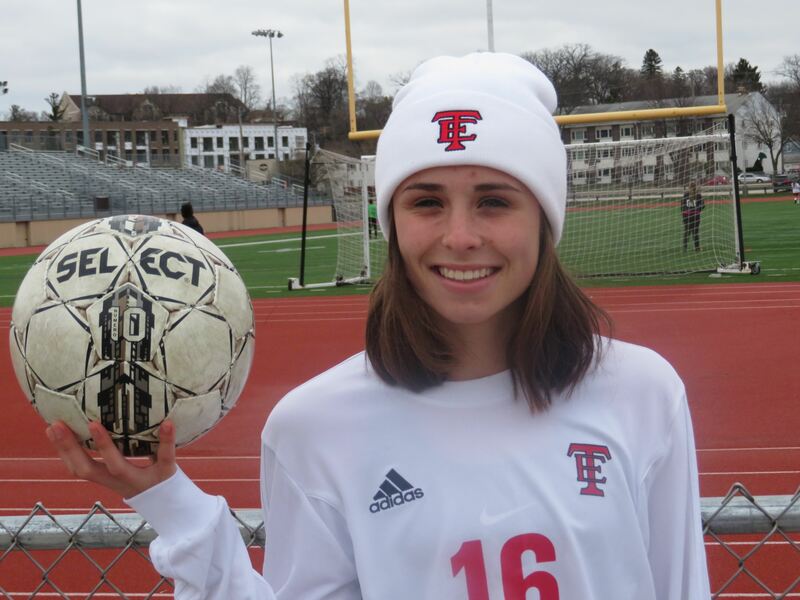 Wauwatosa East junior Liz Bueckers has adapted well after seeing her role change every season for the Red Raiders soccer team. "My role has changed every year, but now we're playing a really high press formation," the fiery forward said. "My job this year, for example, is to score goals and high press their forwards - just get everybody up the field, tell everybody where they're supposed to be because it's kind of a new formation for everybody and I want to help them understand it." Coach Eric Dale expanded on how much Bueckers' role has changed because of her experience and talent. "She is a leader and she is our scorer," the veteran coach said. "She can do so many other things too, but when the ball comes to her feet, she can do some special things. She is able to run (with the ball) and not lose a step. She accelerates with the ball at her feet. She's gifted with the ball. "She's a born scorer. She has a knack for finding the net. She is also very unselfish, which makes her a unique soccer player. She's dangerous both with the ball at her feet and she can play balls in too." Bueckers (pronounced Beckers) is a two-time All-Greater Metro Conference selection - named to the second team as a freshman and first-team as a sophomore last year. Bueckers' success isn't surprising looking back at her career. "I started playing when I was 4-5 years old with a little Micro-Soccer program," Liz recalled. "Then I played 'rec' with boys. When I got to middle school I played girls club soccer." Playing at the club level is what really sold Bueckers on the game. "When I got to the club, I just fell in love with the traveling, the competitiveness," she said. "My team was very good and we were successful. It just made me want to keep going. I played with the Tosa Kickers in middle school and with the Elm Grove Soccer Club through high school." Dale, who was a varsity assistant at the time, recalled when he first laid eyes on Bueckers. "It was the summer of her 8th grade season, she was going to be entering Tosa East in the fall," he said. "(Then head coach) Rob Bukowski and I had heard she was quite a club player and had seen her in tournaments and things like that. We knew we were getting a special player when Liz came up here. The nice thing about it is she has a great supporting class. The junior class is exceptionally strong. She was a finished product, so now it's just a matter of fine tuning things." It didn't take long to know the Red Raiders were getting an outstanding talent. "It took all of 20 minutes of tryouts her freshman year to make us realize she was ready for varsity play physically and skill-wise and her speed really sets her apart too," Dale said. "Her competitiveness is really the draw with her. 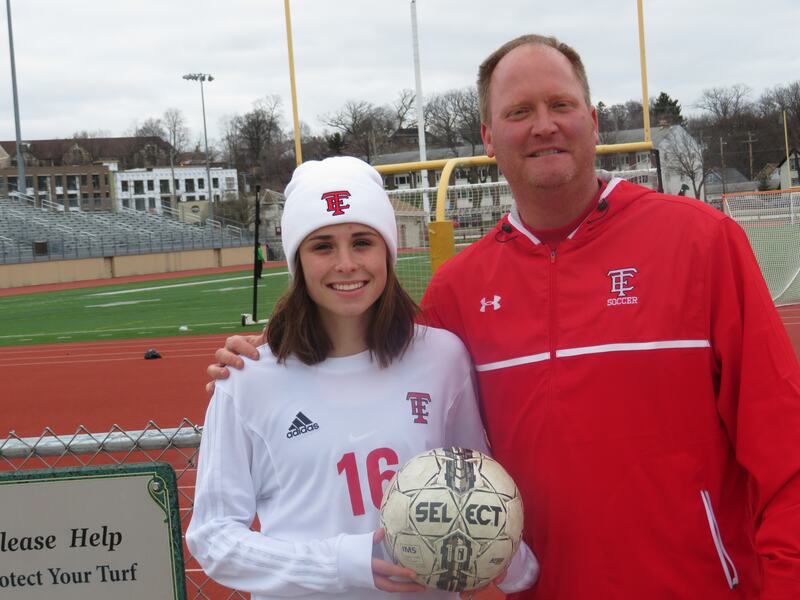 I've coached hundreds of athletes at Tosa East and she is easily one of the most competitive." Dale and his staff are harder on Bueckers, looking to make her even better when she plays at the next level since she accepted a scholarship to play at Indiana University Purdue University at Indianapolis (IUPUI). "She knows I kind of hold her to a higher standard when we she has things in her game that she needs to improve," he said. "She speaks her mind. She's played the game long enough that I think she has a decent feel for the game, but we also want her to know that just because she is one of the better players on the field when she steps to that next level of college she is going to be expected to do more for them. "We're tough on her, maybe more than we need to be at times, but I think that's something we can help her with. If she improves that mental toughness - she's pretty strong already - but can move that up a notch, the sky's the limit for her." Bueckers laughed when told what Dale had said, but understands where he is coming from. "If I thought I did it good and I was proud of myself, sometimes I would get a 'This is what you need to do better' instead of 'you did a good job.' But I kind of take that as they're just trying to make me better. They want me to succeed." Dale talked about one of Bueckers' most important qualities. "That willingness to compete in everything," he said. "She's an excellent student, a high honor roll student. She's going to be a National Honor Society student I'm sure. She recently signed with IUPUI. She was hell bent on doing it. To commit as a junior is a rare thing, in soccer especially, but her tenacity and her competitiveness and her enthusiasm just really set her apart from a lot of kids she plays with." Liz also has played varsity basketball for for two years, earning honorable mention honors this season. When she came to Tosa East, going out for basketball was something she had to think about. "I was actually kind of debating playing or not," she said. "I really wanted to focus more on soccer because I wasn't committed (to a school) yet. I wanted to improve myself as much as I could because I know that's what I want to play in college. But I have never heard anyone say multi-sport athletes are a bad thing. It exercises different muscles, prevents injuries, keeps me fit through the winter." Liz is a perfectionist in whatever she does and took a moment to describe her unbelievable drive. "For the past few years in high school if we lost a game and I knew if I was doing something bad in the game it would make me want to go work on my game on my own the next day," she said. "I would just have to work at it, work at it and work at it harder. I just love to see it pay off in the games. Scoring a goal just makes me know I'm doing something right." Bueckers knows her strengths, but she also knows what she needs to improve on. "My mental toughness and aggressiveness; my ability to go past players and my speed and my ability to score goals are my strengths," she said. "My strength has always been to just blow past everybody, so I really didn't need the foot skills. "I now need to improve my agility with the ball, getting quicker. I need to improve my shot, so I can place it better and using my left foot. But now, if I'm going to play at a higher level, I need to get my game together all-around." It's not surprising that Bueckers is one of three junior captains along with Sarah Lessila and Elyse Reagan. "Our girls always select the captains for next year and Liz was the leading vote-getter from the students who graduated," Dale pointed out. "They saw potential in her as a leader. She needs to be a little more vocal. She's vocal in a way that is beyond rah-rah. She wants people around her to step up their game as she steps her game up." At times Bueckers' competitive nature comes through too strong in her leadership role. "Sometimes she doesn't know how to handle (a situation) with kid gloves necessarily because she's such a competitor and she's fiery," Dale said. "We can rein that in a little bit, but she is a motivator too. All the girls look up to her. When we need something to happen on the field, they'll look to Liz too. There's that level of expectation." Photo by Tom 'Sky' Skibosh. Liz Bueckers with coach Eric Dale. Liz admits she is very proud to be a team captain and takes her role seriously. "It's really important considering my coaches hold me to a higher standard," Liz said. "I wear the captain band now everybody's expecting me to do better. I really hope I can step up to those standards and it's really important that I live up to that role. "It definitely means more to be named (captain) by one of my own teammates. Being named by a coach is still nice, but knowing my teammates feel I have the ability to lead the team (is important). "I've been more accepting to the role as the season has started rather than in the past season. My teammates are starting to listen to me. I really just show them how hard I work at practice so they can work as hard too. Show them how good we can be. Show them my drive to win games; see if I can spread it throughout the team." Dale feels no one will outwork Bueckers, ranking her among some of the hardest-working players ever to wear the Raider red. "I've been at Tosa East for almost 20 years and I've seen a lot of athletes," Dale said. "I've seen Devin Harris, I've seen Jerry Smith, Tony Walls, I've seen the Cupertino brothers. She is on that level in terms of competitiveness and desire, which is all so exciting. Beyond high school she has got so much more ahead of her. She wants to go into engineering. "Like I said, the sky's the limit with her. She is easily one of the best competitors, best enthusiast for the game that I've seen at Tosa East." FAVORITE MOVIE: 'Divergent' Series, Action, Comedies. FAVORITE PLACE YOU VISITED: Hilton Head, S.C.
WHAT DO YOU DO TO RELAX? Sleep, Clean, Organize. MOST MEMORABLE SPORTS MOMENT: Free kick goal in 70th minute to tie Tosa West last year, 1-1. WHAT WOULD YOU LIKE TO DO IN THE FUTURE? Accepted scholarship to play soccer at Indiana University Purdue University Indianapolis and study engineering.